Xanthones are one of the most powerful fytonutriënts in the rind of the mangosteen. Xanthonens have powerful benefits. Scientific research shows that xanthones can promote your welfare. Modern science is only now beginning to understand and explain why the rind of the mangosteen fruit has been so revered for centuries. However, we know this: to benefit from the complete power and nutritional impact of the mangosteen fruit, it should be consumed just as it has been for more than a thousand years—in its whole fruit form. The mangosteen rind has been shown to have the same level of this active ingredient as found in green tea. The same benefit touted in grapeseed extract, proanthocyanidins are found in efficacious amounts in the whole mangosteen fruit. As awareness and consumption of the mangosteen has increased worldwide, so has the need to better understand the fruit’s most prominent phytonutrient, xanthones. After all, the mangosteen fruit has nature’s most concentrated source of xanthones, a family of vigorous antioxidants. To establish a rapid, dependable approach for identifying xanthones in their naturally occurring state, researchers were asked to develop a credible, easily duplicable analytical method for testing and measuring xanthones in the rind of the mangosteen fruit, Garcinia mangostana. The whole mangosteen fruit rind was chosen as the standard because its response factor is similar to many of the naturally occurring xanthones. The peer-reviewed, single lab validated High Performance Liquid Chromatography (or HPLC) analysis of selected xanthones in mangosteen fruit study was published in the June 2007 issue of the Journal of Separation Science. The study utilized AOAC protocols. AOAC International is a not-for-profit scientific association that sets standard methods, allowing consumers to have confidence in analytical results obtained from scientific analysis. An 80:20 acetone/water mixture was used to extract the xanthones from dried, ground whole mangosteen fruit rind. A total of six xanthones were purified by preparative HPLC, utilizing the same solvent system and UV detection as for the analytical method. Each compound has unique UV absorption spectra that allows for easy identification of the xanthone found naturally in the mangosteen fruit. The study establishes a credible scientific method for testing and measuring xanthones. Six specific xanthones have been identified, and their relative response factors determined. Although additional xanthones are in the process of being identified and measured, this research ensures a more consistent and reliable marketing of mangosteen products to consumers relative to xanthone content claims. A pre-clinical, preliminary 28-day study of XANGO® Juice identified the bioavailability of xanthones to determine how many xanthones the body actually absorbs and the pathway they travel. A validated xanthone analysis method was used to measure the quantities of the alpha-mangostin xanthone found in blood plasma. Michael W. Pugh, B.S., XANGO research and development senior manager, Michael Pugh has more than 15 years experience in the natural products industry and is currently head of Research & Development for XANGO, LLC. In this capacity, Pugh has implemented safety studies, initiated analytical work and validation, established pharmacokinetics and oversees all clinical work. Charles River Laboratories Charles River Laboratories is a pre-clinical lab that was established in 1947. It is world renowned for its research models in safety, pharmacokinetics, and in-vitro work. It employs 7,500 employees, including 500 researchers that include PhDs, MDs and DVMs. The validated plasma method used LC-MS/MS technique to identify and quantify the amounts of alpha-mangostin in the plasma. This new analysis can quantify levels as low as 1 nanogram per ml (ng/ml). The preliminary research demonstrates that the body absorbs xanthones in low dosages and that very high levels of xanthone consumption actually result in decreased absorption efficiency. In addition, preliminary results showed long-term daily consumption of XANGO Juice increases the levels of xanthones in the blood. In approximately 3.5 hours, the xanthone has been absorbed during digestion. Females have a more efficient absorption rate than males. Long-term consumption of XANGO Juice causes a blood loading effect. Alpha-mangostin is absorbed the way nature intended, at very low doses of consumption, such as the amount contained in XANGO Juice. This study allows for a solid foundation for future clinical trials. Also, these preliminary findings show artificially inflating a product with xanthone extracts does not add any value. 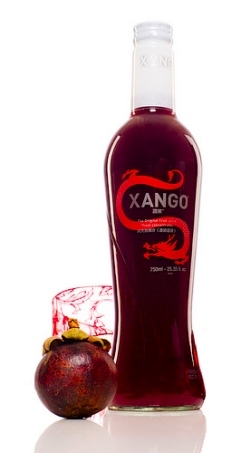 The whole mangosteen fruit, nature's most abundant source, contains 39 different xanthones (as found in XANGO Juice). C13H8O2 a unique class of biologically active compounds possessing numerous bioactive capabilities. They are a unique class of phytonutrients. Xanthones—found in the whole mangosteen fruit can promote general health. Any of various bioactive chemical compounds found in plants, such as xanthones, considered to be beneficial to human health. Also referred to as phytochemical. The walls of a ripened fruit, consist of three layers, the pepicarp, mesocarp and endocarp. Also referred to as the rind. The investigations of the bio-active components of the mangosteenfruit in XANGO's mangosteenjuice are convincing. It has been established that XANGO Juice has a beneficial effect on general health. This proven advantage is already reason enough to order XANGO Juice NOW. Maybe, as a researcher, you are more interested in the exact data around XANGO Juice. On the page “Ordering info” you will find specific product information, such as quantities per packaging, shelf-life, delivery condition and, of course, the prices! Click on “Ordering info”. Are you interested in research and/or science and do you want to examine the list of researches on the internet? Please use the contact form by using the following “email us” and request for the information so that you can explore yourself. The French priest, investigator and world traveler Laurentius Garcin has documented the mangosteen for the first time in 1733. Since then, the fruit is named: Garcinia Mangistana. 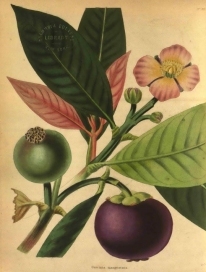 Queen Victoria promises, one year after her Coronation in 1839, that the man who brings her the wonderful mangosteen- fruit, would become a Knight. This resulted in it’s nickname: "Queen of Fruits. Unfortunately, no one succeeded in that time. At that time, the journey from Asia to England took too long to be able to bring this fragile fruit, still edible, to England.